Unfortunately I won't be landing in Paris this April, but a new film based on a French cult classic novel will be. Written by Boris Vian in 1947, L'ecume des Jours, has been translated into English as both Foam of the Daze and Froth of the Daydream and has been adapted for the screen before. Scroll down to see the poster for the film made by Charles Belmont in 1968. The synopsis on Dark Horizons is quite a tease! "a world where you can travel around on a pink cloud or literally be swept off an ice skating rink into a hole"
"Vian’s surreal tale revolves around a wealthy young man named Colin, inventor of an “olfactory-musical invention” called the pianococktail. He meets and falls in love with a woman named Chloe, only for her to become ill when she gets a water lily in her lung. The only way for Colin to treat her sickness is by constantly surrounding her with flowers, which eventually drains his funds.Meanwhile, Colin’s married friends Chick and Alise suffer problems of their own when Chick becomes so obsessed with the philosopher Jean-Sol Partre that he begins devoting all of his time, money, and attention to collecting Partre’s books." According to the publisher, "L'Ecume des Jours is a jazz fueled Science Fiction story that is both romantic and nihilistic! Vian's novel is an assortment of bittersweet romance, absurdity and the frailty of life. Foam of the Daze is a nimble-fingered masterpiece that is both witty and incredibly moving. 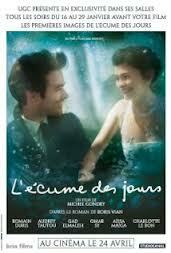 It is a story of a wealthy young man Colin and the love of his life Chloe, who develops a water lily in her lung. The supporting cast includes Chick, an obsessive collector of noted philosopher Jean-Sol Partre's books and stained pants, and Nicolas who is a combination of P.G. Wodehouse's fictional butler Jeeves and the Green Hornet's Kato. The soul of the book is about the nature of life disappearing and loving things intensely as if one was making love on a live grenade!" This looks great, I don't get to see nearly enough French movies, but I do always enjoy Audrey Tatou.